ITV has deployed four specially converted Mitsubishi Outlander PHEVs, marking the first hybrid vehicles on its fleet, as it looks to go more eco-friendly. In use as Outside Broadcast vehicles for its Good Morning Britain and This Morning programmes, the Outlander PHEVs replace the traditional diesel ‘Sat Truck’ and, more recently, ‘Sat Van’ that the broadcaster has previously used. The switch to the new ‘Sat Cars’ was made possible by work to reduce the size of the on-board transmission equipment used by ITV as well as specialist conversion by Mitsubishi Special Vehicle Operations (MSVO) within a four-week timeframe. 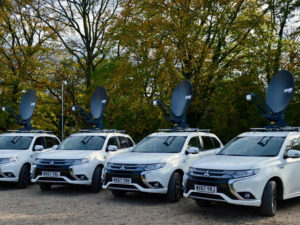 Working with ITV’s system integrator BWS (Broadcast Wireless Systems), MSVO fitted the Outlander PHEVs with an auto-pointing satellite dish, which works to detect and pull an internet signal into the on-board transmission equipment in areas where there is weak or non-existent coverage. They also come with a power invertor, split charging system and a selection of audio-visual and communications kit. Completing each vehicle is magnetic programme branding.